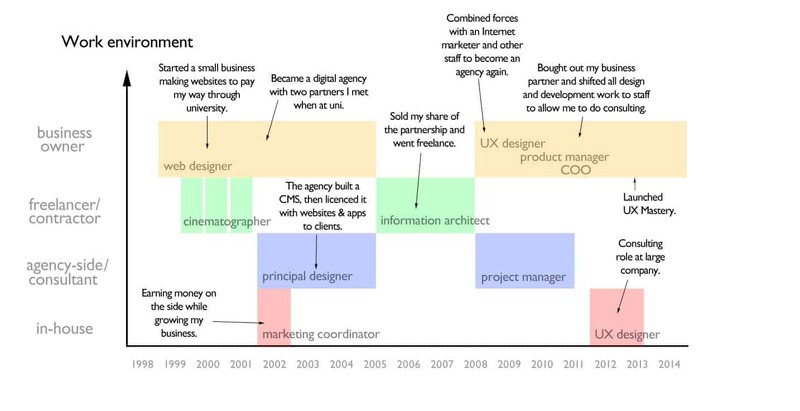 Home» Careers » UX Self-Assessment: Where Are You Coming From? This is a sample chapter from Get Started in UX: The Complete Guide to Launching a Career in User Experience Design. This excerpt was originally published on UX Matters. OK, so you’ve decided you want to enter the User Experience field. Your head may be spinning, either because you’re overwhelmed—or excited—by the prospect of what lies ahead of you. It’s worth taking a few moments to reflect on why you want to begin a career in UX. As you’ll soon come to understand, the sheer amount of information that you’ll need to absorb is potentially overwhelming—although I’ll give you some strategies for dealing with this later. And there’s no shortcut in gaining project experience—that comes with time. This is a journey you’ll want to be embarking upon for the right reasons. Personally, I get excited by the variety that UX offers me: the breadth of design challenges and the range of activities that I get to engage in—with other people and on my own. I’ve learned over the years that I need that variety for job satisfaction. A job where I can apply my visual skills, my technical skills, and my people skills is one that I find incredibly rewarding. The fact that the outcomes of my work—Web sites, mobile apps, user interfaces—often empower the people using them is the icing on the cake. What Is It About UX That You Are Drawn To? Whatever your personal motivation to succeed in the field of UX, it needs to be more than the cash or the glory. Work out your why, and the challenges ahead will feel less daunting. It might feel a bit contrived, but I have an exercise for you to try your hand at. I want you to put this ebook reader down—or minimize the window on your computer—pick up a pen and paper, and complete this sentence for me. Try to avoid referencing salary or recognition in your statement. Write it down. Seriously, I’ll wait! If you were redesigning a shopping cart, with the goal being to increase the number of sales the site processes, the first thing you’d need to know is how many sales it’s currently making. Deciding how best to tackle your entry into User Experience is a lot like tackling a UX project itself—you need to have a baseline. Understanding where your skills are at now is a prerequisite to charting where you want to go. There is no one “best” way to perform this self-assessment. We humans and the skills we possess are complicated! However, there are a few different approaches that have been devised specifically for thinking about a career in UX. Let’s look at a few. Elizabeth Bacon’s sundial of User Experience fields is a wonderful model for looking at the big picture and how your knowledge stacks up. To progress toward operating at a strategic, big-picture level—arguably the ultimate goal for all practitioners—one needs to be able to understand, define, and communicate a vast range of fields. Of course, no one person can be expected to have in-depth knowledge of all of these subject areas. One of your career goals should be to become an expert in one or two of them, but maintain a balance across the entire spectrum. Here’s what Elizabeth’s self-assessment looks like. This paints a holistic picture of Elizabeth’s experience. As a senior designer, Elizabeth is clearly strong in interaction design and several closely related fields. She also has a good understanding of other areas, and this balance no doubt serves her well as she interacts with developers, business owners, users, content producers, and other team members involved in her projects. For now, it suffices to say that, no matter how skilled you become in one area, there is always more to learn. Bundled with this ebook is a UX self-assessment kit. Print out the sundial and use it to perform your own self-assessment. There’s no need to get fancy with graphics software—just color in the wedges using a marker. Pin your self-assessment poster up in your cubicle or at home so you have it on hand as a reminder of the areas that you hope to develop. There’s also an interactive version of the UX sundial, which UX designer Thomas Yung was inspired to create after reading this book. Wonderful work, Thomas! Rate yourself in each of the following categories from 1 to 10, with 1 meaning “I’m a complete beginner” and 10 meaning “I’m an expert.” Answer honestly! You’ll notice that all of these skills are quite independent of the fields we just looked at. They’re not the type of thing you take a class in and master over the course of a semester; they’re life skills, and you work on them throughout your career. In the fields in the previous section, in-depth knowledge of all fields is practically unattainable. However, it’s entirely within the realm of possibility that someone could potentially master all five of these soft skills. When visualized, your goal should, therefore, be to achieve maximum coverage rather than an even balance across the spectrum. If you’re coming to UX from a career in a different field, another lens through which to view any relevant experience you may have accumulated is to consider the environments under which you’ve operated. UX is a pretty broad umbrella, so while some of your previous roles may not be directly related to UX, you may have performed them in environments that allowed you to develop business and workplace skills that you can still leverage in future roles. In-house—You are working as an employee in a company, on a product or service that the company sells. You may be working in isolation or as part of a team. Agency-side—You are working as an employee in an agency, providing consulting or other professional services to a range of clients. Freelance/Contractor—You are working independently for a company, providing consulting or other professional services to them or their clients. Business owner/Independent consultant—You are the owner or part owner of a product or service business. You may get hands-on with product development, consulting, sales, or other activities; but a large number of your tasks also include planning and making strategic decisions about your own business. You can chart your career in a way that demonstrates in which environments your experience was attained. Here’s a chart of Matt’s career—not including part-time jobs throughout high school or university. This is obviously a simplification of the nuances of different employment circumstances, but even if only for your own reference, it’s a useful technique for reflecting on your journey and the direction you may wish to head next. Contrast this with Luke’s career, which is wildly different and tells the story of someone who was far more entrepreneurial in the early stages of his career. Many of the UX techniques we discuss are strictly operational. These are important, but different roles allow you to have differing levels of input on a business’s strategy. While the challenges of directing a business strategy of a one-person startup are wildly different from making strategic decisions within a large corporation, it’s still useful to visualize at what stages you’ve had the opportunity to apply strategic thinking. Here’s what that visualization looks like for Matt. It can be interesting to compare these two graphs by placing one on top of the other. Here’s how that looks for Matt’s career. While there’s not necessarily a one-to-one correlation between the environment one works in and the degree of strategic thinking that one engages in, understanding this data can help you make decisions about how to direct your career. It can also be a very effective instrument for communicating that experience to a recruiter or prospective employer. If you’re just starting out, don’t jump straight to the strategy stuff without logging some hours in the trenches. Strategy is important to strive for, but a good understanding of and experience in user-centered design is invaluable for being able to give authoritative strategic advice. Your UX self-assessment kit also includes templates for soft skills, work environment, and strategic thinking, which you can print out, color in and post somewhere to remind yourself of. Remember to be honest with yourself—you should view the self-assessment exercise as an opportunity to identify areas that you can focus on to one day become world-class in that skill, not as a means to impress someone. OK. Up to this point, I’ve given you a handful of starters and side dishes, but you’re probably still hungry for more information. Here’s the main course—the steps you need to take to launch a successful career as a UX designer. There are just six of them. For the rest of this book, we’ll be exploring each of these steps in turn. Why do you want to get a job in user experience? If you’re just chasing a salary, you’re unlikely to be fulfilled or successful. In which fields do you have the most knowledge and experience? If you’ve worked in other industries, there’s a good chance you have existing skills and experience that you can leverage in a UX role. An honest self-assessment will help you determine which areas to expand your knowledge of. In which of the five soft skills are you strongest? Which of these skills need the most work? What opportunities can you seek to further develop these blind spots? In which environments do you have the most experience operating?Staying within familiar territory may be comfortable, but the different dynamics of work environments encourage professional growth. At what level on the strategic plane is the majority of your experience? Seek opportunities to get exposure to more strategic-planning and decision-making roles. Know your why. Basing your decision purely upon the expectation of an increased salary is not good grounds for changing your career. User experience is a vast umbrella. A self-assessment will reveal the fields that you’re most knowledgeable about and those that you may need to focus on. Analyse your soft skills. Make it a goal to seek out opportunities that allow you to further develop those skills that you are weak in. Reflect upon the types of environments that you have experience working in. Consider opportunities that give you exposure to different environments. Throughout your career, seek opportunities to learn about and understand how business strategy and UX influence each other.Your goal should be to develop a core competency in the strategic planning, advice, and direction of a product, service, or business. Like what you read? Grab yourself a copy of Get Started in UX now. Great article! Thanks for putting it all together. I am not working strictly in UX but I am surrounded by it.